Two years ago I looked at pictures of women facing metastatic breast cancer and wondered how they could be smiling. How could they be laughing – don’t they know the reality of this awful disease… today I laugh spontaneously, smile much more often than I frown. 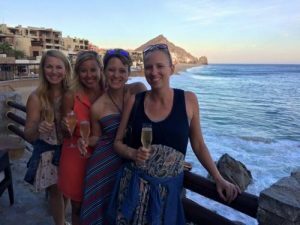 A couple weeks ago I spent 5 days on the tip of the baja peninsula of Mexico with 3 college besties to celebrate all of our 40th birthdays happening this year. It was relaxing & rejuvenating to sit on the edge of the ocean and watch the waves crash and fall back into 1995 like it was yesterday. Lifelong friends are simply special. Even though we came from 4 states and only see each other a couple times a year – we stepped right back into our friendships. Celebrating with laughter, champagne and birthday cake every night! Then after a quick 18 hours in Louisville I headed to the Young Survival Coalition Conference in Atlanta, where Hope Scarves was an exhibitor and I, the closing keynote speaker. This is the conference where I gave away my first scarf in 2009 and where we launched Hope Scarves in 2012. To come full circle as a keynote speaker was monumental for me and for Hope Scarves. I shared my heart on that stage, sharing my story and my plea to better support women facing stage iv breast cancer. My ides were met with a standing ovation and I sincerely hope the metastatic survivors in the room felt the love and support. I look forward to working with YSC on deeper partnership with Hope Scarves and helping them continue to bring metastatic survivors to the core of their work. 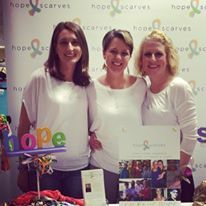 The conference was also a special time for me to reconnect with a couple founding board members, Alabama friends Gelia and Julie, who were with me from the very start of cancer and Hope Scarves. Seeing them share Hope Scarves with survivors warms my soul. It means so much to me when friends come along side me in my efforts with Hope Scarves. I am forever grateful to have such great friends and family join me to spread a message of hope. Following the conference my friends and I packed up and drove to Birmingham. There, with the help of more great friends, we hosted a kick off for our Alabama Hospital Partnership with an event “Sweet Hope Alabama” at a cute little shop called Fab’rik. My old stomping grounds of Homewood always feel like home, but even more so seeing old friends, neighbors, co-workers, church friends and board members from our days in Alabama warmed my heart. So many people came out to support Hope Scarves. We raised over $2,500 to kick off our program there and I know this is just the beginning! Returning home after 11 days to big hugs from my boys was the icing on the cake. They did great while Jay and I were out of town – thanks the the help of my parents. Short of one trip to the emergency room and a neck brace… that’s another story… boys! Now I sit here sipping tea and thinking about how happy, healthy and blessed we are… There are certainly moments when my anxiety gets the best of me- when my aching joints and back worry me or when I read about another friend facing pain and sorrow in the face of this disease. It’s hard. This diagnosis has given me the power to live in the day. To live my life in big, bold ways that I have always wanted, but maybe didn’t seem practical. Our family is headed to Belize next week with my parents, brother and his girlfriend Kristen. We are excited to take the kids to a new country and show them Central America. 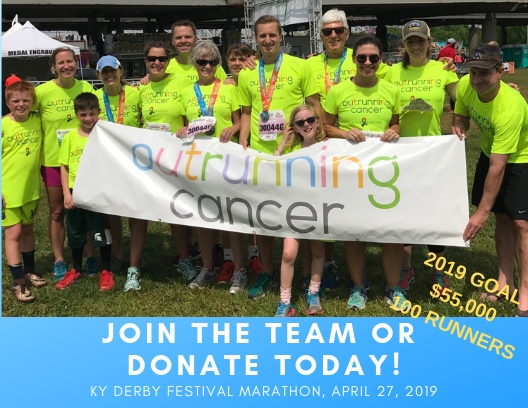 A couple weeks after that I will run a 1/2 marathon as part of our Outrunning Cancer team- with many friends and family which just means so much to me. After that I travel to Big Sky Montana for a yoga retreat. Plans are in the works for the Team Mac out west adventure – taking the kids camping in several National Parks in June. Then, summer in Michigan… I set out to live my 40th year in a big way! To travel at least once a month, to exercise and laugh (loudly) and to celebrate the moment. Realizing life is precious. I don’t know how long this stretch of good health will last, but I know I have today. I can’t change the fact that my breast cancer came back and I have stage iv cancer. But, I can chose how I live this life. I chose hope over fear and happiness over sadness today… And, I think tomorrow too!